8 Rick & Morty Coffee Memes Fr..
Ethiopia is the world’s fifth largest coffee producer, so it’s no surprise that many origin stories of coffee center around the country. Nearly 50,000 folks of Ethiopian descent have taken up residence in the Toronto area, according to the Greater Toronto Area’s Ethiopian Association. With those numbers, it’s no wonder that cafes such as Bu’na: The Soul of Coffee have opened their doors. Committed entirely to traditional Ethiopian coffee and the roasting ceremonies that go along with it, Bu’na offers a hands-on look at the country’s coffee culture. Located on a busy stretch of Queen Street West, the cafe was opened by Nunu and her husband Chris Rampen after the space next to their restaurant, Nunu Ethiopian Fusion, became available. “We were hoping for a synergy between the two for sure,” Rampen says, though he admits that they didn’t have much of a plan in the beginning. When they opened Bu’na, they decided to offer an extension of the popular coffee program offered at Nunu and expand on it. Like other third wave coffee shops, the space itself is open and airy with beautiful tile work, wood finishings, and bench seating. As you step into the cafe, you’re immediately hit with the smell of freshly roasted beans, which is something they take very seriously. Each day, the baristas hand-roast batches of freshly imported Ethiopian beans every hour to ensure patrons are receiving the best taste possible. For folks who are looking for a quick espresso shot, the bar stocks a Mahlkönig EK43 grinder, a Faema E91 espresso machine, and a Versalab Pneumatic espresso press. But the cafe is loyal to Ethiopian coffee culture and all its traditions: Many customers have come in for a simple jebena or the full-blown roasting ceremony. “Friends have told them about jebena coffee so they come in and we serve them a jebena as if it’s an espresso,” says Rampen. The biggest thing that Nunu and Rampen have been working on is having their customers stop to take time and enjoy the full-blown roasting ceremony. Rampen explains that many customers don’t understand that the process can take just under 20 minutes from start to finish but is a whole experience in and of itself. “We don’t do it for the spectacle. We do it for the sensual aspect of it, which creates a superior coffee experience that everyone should have in their lives,” he says. As the popularity of the shop grows, the couple has been looking to the future. Currently, the shop offers a coffee sommelier course and a coffee roasting course, aimed at folks who have a keen interest in or are involved in specialty coffee and want to learn more about how to handle Ethiopian coffees. By offering these courses, they hope to give experiences to a new generation of folks who might not have the chance otherwise to obtain this knowledge. The cafe also sells specific products such as jebena sets imported from Ethiopia, green beans (which you can roast in-house with one of their classes), and pantry products made by Nunu herself. The couple has also been exploring becoming a wholesale distributor for the cooperative they’ve been working with in Ethiopia. But as Rampen explains, the business model is still to be developed for that. 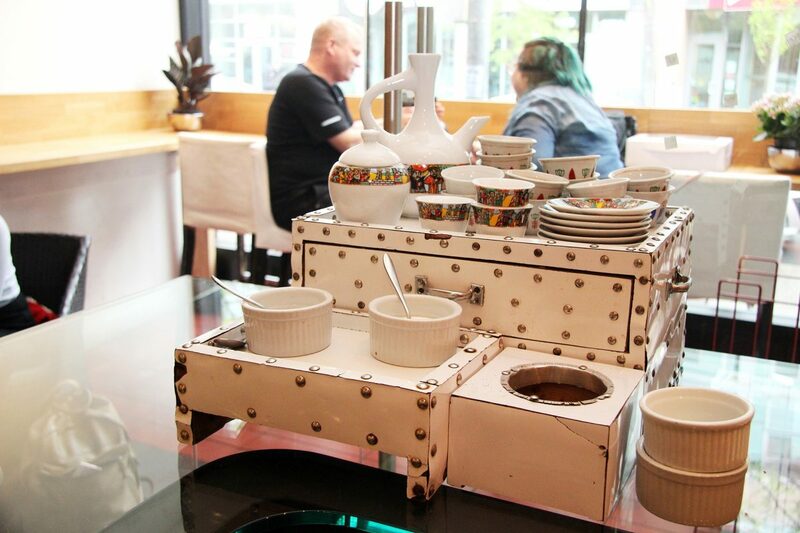 Until then, Bu’na ensures Toronto has the experience, tradition, and history of Ethiopian coffee culture. Bu’na: The Soul of Coffee is located at 1176 Queen Street W, Toronto. Follow the cafe on Instagram.